Apple has, for a good while now, been looking to expand the reach, functionality and general usefulness of the Apple Store app. In short, the Cupertino company wants it to serve as the focal point of the consumer’s Apple experience, and in order to help familiarize iOS users with the service, the company has been running a series of promotional giveaways. Going on the premise that everybody loves a freebie, we’ve already seen paid apps go free through the Apple Store app, and over the festive period, a special free playlist of tracks was compiled and distributed in the spirit of the occasion. Today, Apple is back with another free mixtape of sorts, pushing a three-song bundle out focusing on new artists for 2014. The previous playlist included recognized artists such as R&amp;B singer Mary J. Blige, as well as American Idol winner Kelly Clarkson. But this time around, Apple free playlist hopes to provide a springboard for lesser-known artists, including Bad Suns, Kris Bowers, and Master Blaster Sound System. The playlist can be downloaded for free via the Apple Store app, and the offer will run until the end of the month. To take advantage, you will need to fire up the Apple Store app, after which you will be redirected to the iTunes app for the subsequent downloads. As ever with a giveaway, though, there are one or two limitations. First and foremost, the offer is only available to those residing in the United States. As well, if you happen to have picked up the Apple Store App for iPad, which launched back in November of 2013, you will unfortunately not be able to take advantage of this freebie. Still, if you’ve an iPhone, live in the U.S., and are on the hunt for some new music, be sure to check out these three free songs courtesy of Apple. And like we said before, the Apple Store app is a major requirement for the free songs to happen. So grab the app from the iOS App Store, it’s absolutely free to download. 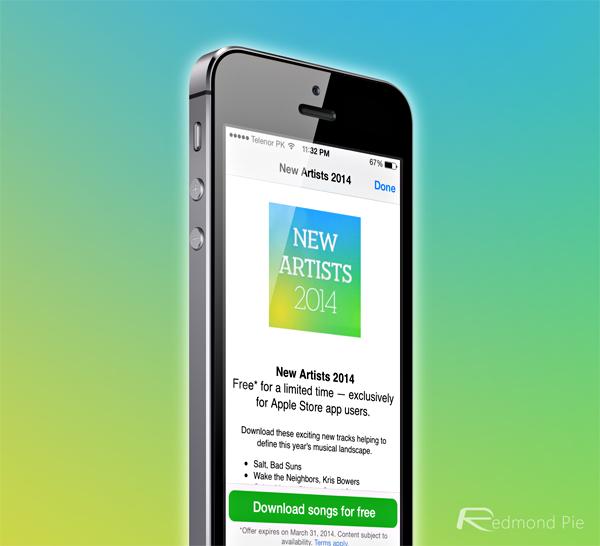 Launch it, scroll down and tap on New Artists 2014.